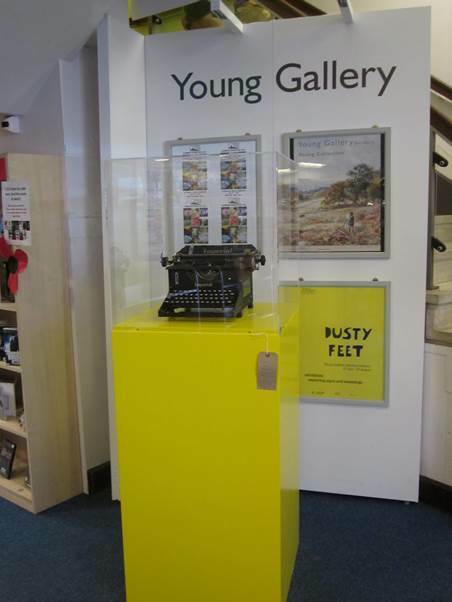 The Dusty Feet exhibition opens to the public in the Young Gallery at Salisbury Library today. This delightful, quirky and interactive exhibition is about text in all its forms and signs. 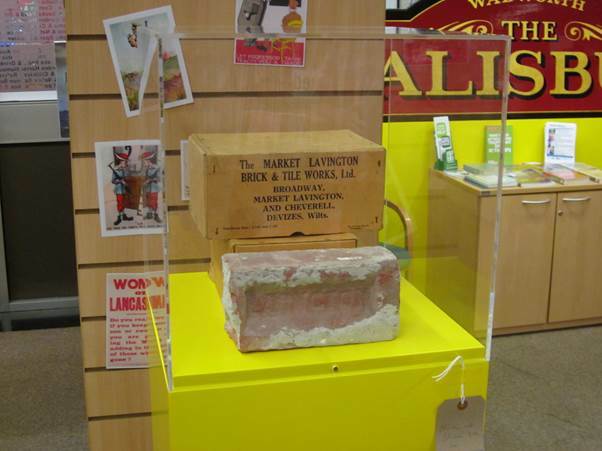 And we at Market Lavington Museum have contributed by loaning items to it. 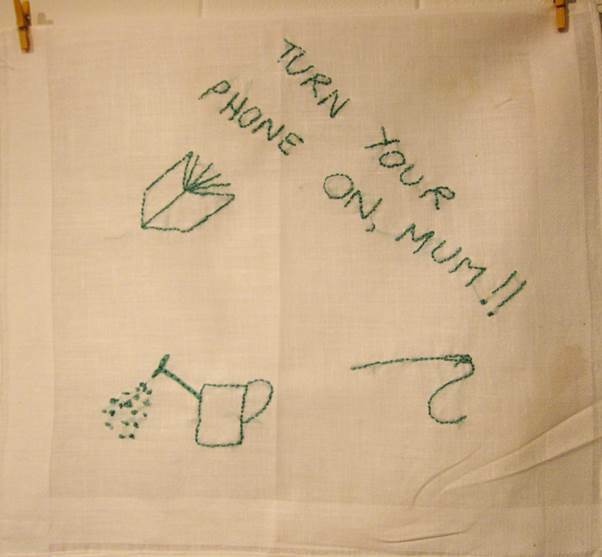 And good folks from our area and elsewhere have embroidered text messages onto handkerchiefs – they make a wonderful backdrop. 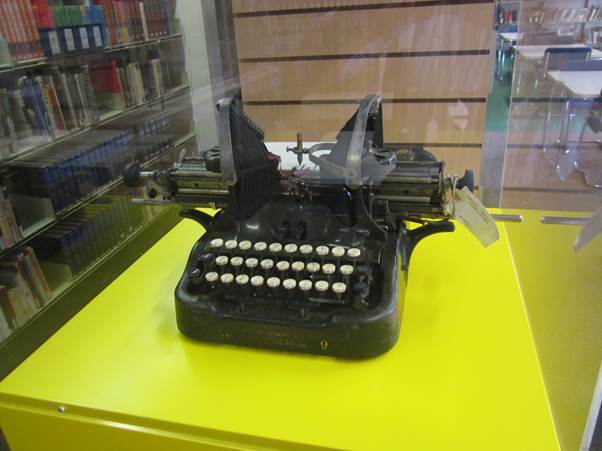 Actually, the exhibition extends into the library itself and you are greeted, in the library entrance, by a Market Lavington typewriter. The exhibition is themed in yellow – it’s very striking. Elsewhere downstairs you’ll find a James Neate collection. 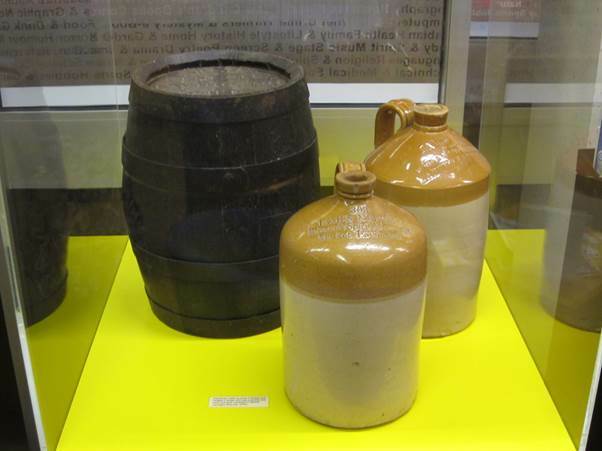 These items are normally close to floor level in our museum. It’s great to see them at a higher level. 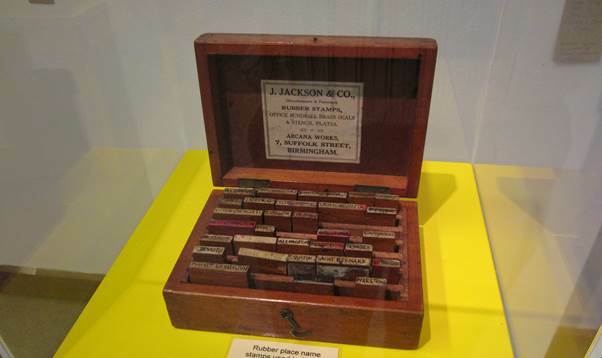 There’s also a brick and brick box display in the main library. But the main exhibition is upstairs (or lift). 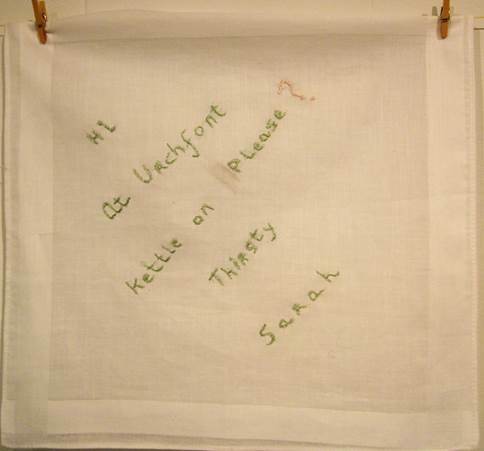 That’s where we find the handkerchiefs and here’s one of them, produced by an Easterton embroiderer. And another is by a Market Lavington person. There are others produced by local talent – maybe more than we realise, for some are anonymous. Our well known door from Mr Walton’s shop is in the main exhibition. The photo doesn’t show that staff at the shop, over the years, signed the door. 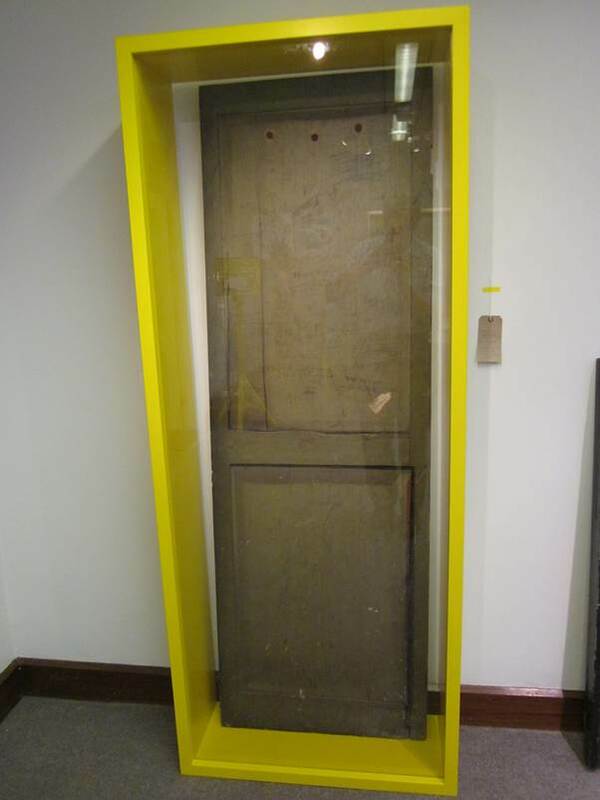 The exhibition has another door which you are invited to write on. Our rubber stamps with the names of all the local parishes also feature. We have another typewriter in the IT room. Of course there are plenty of items from elsewhere to tell the tale which has been curated by Kat and Alister of Two Destination Language. The exhibition runs until August 23rd. How wonderful that the folks and visitors in Salisbury can see something of Market Lavington as well. John Anthony Sturton was Vicar of Market Lavington for more than thirty years at the start of the twentieth century. It seems amazing that we know so little of this man. He was born in Little Bedwyn in 1874 so he was a Wiltshire man. His Father was Vicar of Little Bedwyn. In fact church service seems to have been a norm in the Sturton family. Certainly John Anthony followed in his father’s footsteps and on the 1901 census we find him as a clergyman in Lyme Regis, living in lodgings, so probably a curate. He became Vicar of Market Lavington in 1906. By 1911 he was in Market Lavington with his mother and a brother who was also a member of the clergy. 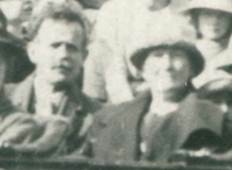 John Sturton married in 1916. He and his wife, Iva, had no children. 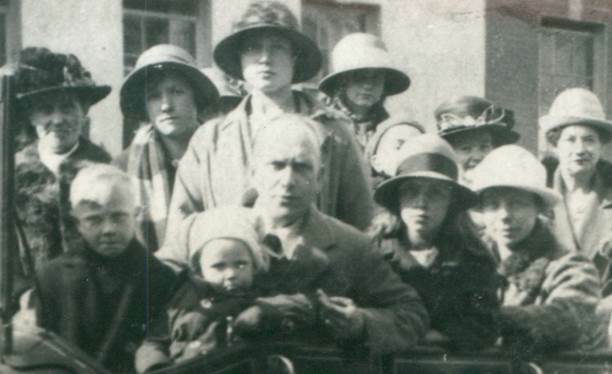 We have a couple of photos of Reverend Sturton and this is one of them. Reverend John Sturton, Vicar of Market Lavington, on his motorbike at Salisbury. 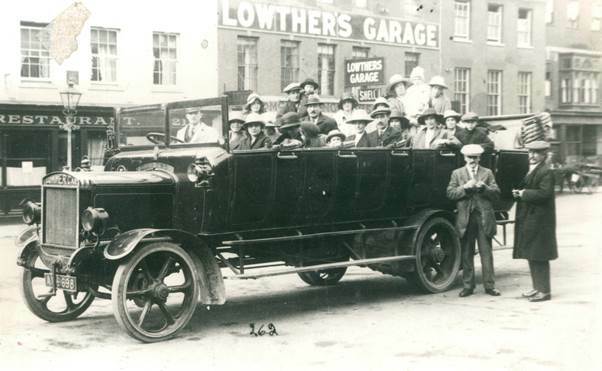 This is said to be a charabanc trip from Market Lavington in the 1920s. The picture was taken in Salisbury. It looks as though Reverend Sturton has joined the party on his motorbike. He has a youngster in his sidecar. The bike, by the way, is a BSA. 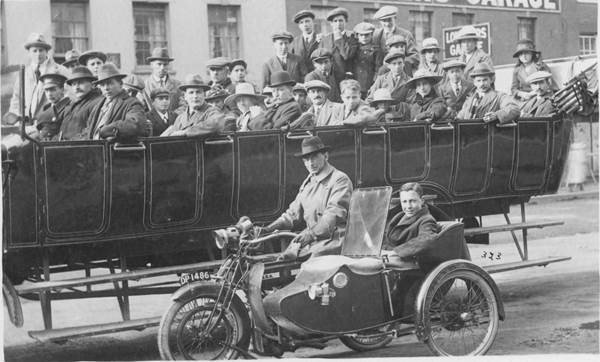 The lamp on the sidecar looks as though it might be an acetylene one. We have a lamp like it in the museum. 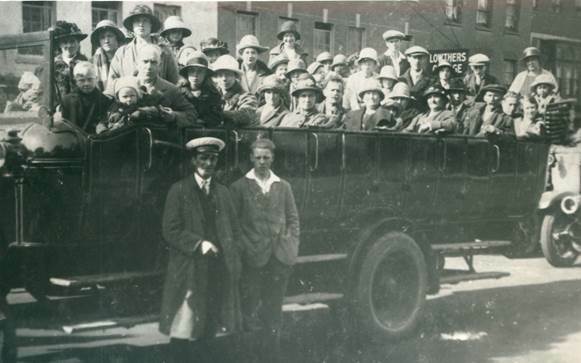 We have not positively identified any of the people on the charabanc but we wonder if the large man sat next to the driver might be Fred Sayer who owned the bus company. 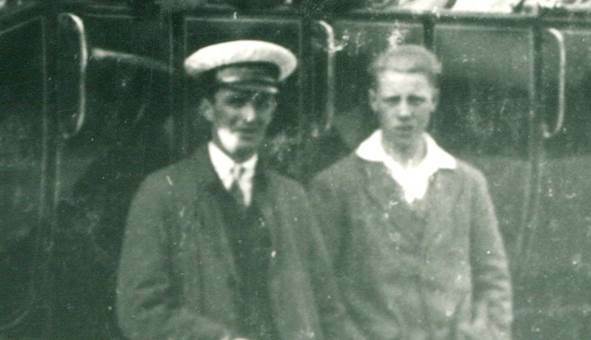 After he retired in 1940, John lived in Easterton. He died in 1945. He is buried in Market Lavington churchyard. Iva joined him there in 1958 and his brother, Thomas, followed in 1960.